Climate Councillor Professor Will Steffen has the answers. 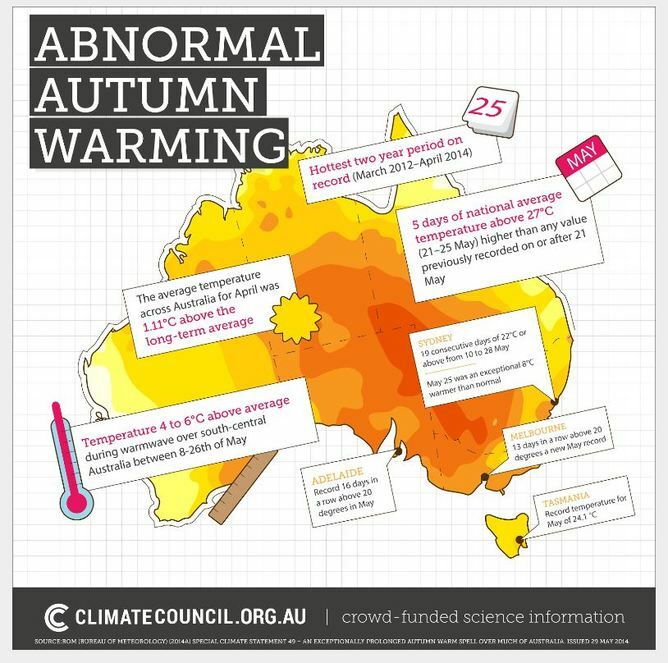 The Climate Council’s latest report – “Seasonal Update: Abnormal Autumn 2014” – delivers three key findings. First, the 24-month period ending with April 2014 was the hottest on record, and once the data for May are analysed, that new record will almost surely be immediately broken by the 24-month period ending with May 2014. Second, the average temperature across Australia for April was 1.1ºC above the long-term average (1961-1990) and May continued this trend of abnormally high temperatures. Third, the climate system as a whole is heating up and temperatures are projected to increase, with more extremely hot days and fewer cool days and the number of extreme fire-weather days is expected to increase in southern and eastern Australia. So, we’re not likely to get relief from warmer-than-normal conditions any time soon. The abnormally warm weather that has seen records tumble during the last two summers has continued into the autumn of 2014. A prolonged warm period from 8 to 26 May was experienced in South Australia, New South Wales, Victoria, and southern inland Queensland, with unusual warmth also extending periodically to Tasmania and parts of the Northern Territory and southeastern Western Australia. Across much of this region, maximum daily temperatures were 4-6ºC higher than normal (the 1961-1990 average) and minimum (night time) temperatures were also well above normal despite the clear skies, which usually lead to lower night time temperatures. Major population centres experienced abnormal autumn warmth. Sydney, Adelaide and Melbourne set records for the most consecutive days in May of 20ºC or above with 28 days, 16 days and 13 days respectively. Sydney experienced 19 consecutive days of 22ºC or above from 10 to 28 May, surpassing the previous May record of 9 days (set from 1 to 9 May 1978 and 1 to 9 May 2007). Many locations in every state except WA set records for high temperatures so late in the autumn season. For example, Canberra recorded a maximum of 21.7ºC on 26 May; previously the latest date a temperature that high occurred in Canberra was 12 May, nearly two weeks earlier. Also on 26 May Birdsville reached a high temperature of 34.7ºC, the highest temperature reached so late in the season at any Australian site outside of the tropics. The Australian area-averaged daily maximum was 27.35ºC or above on each of the five days from 21 to 25 May, higher than any value previously recorded on or after 21 May. The unseasonably warm conditions that many regions of Australia experienced in April and May are likely to continue through winter. Higher-than-average maximum and minimum temperatures are likely over most of the country with the chances of warmer-than-average conditions being particularly high for the southern half of the continent. The odds are increasing that Australia could soon experience an El Niño event, which would likely exacerbate the impacts of climate change by driving temperatures even higher and triggering drier conditions in the east and south of the continent. With the continuing plague of abnormally high temperatures across the continent, the influence of climate change can be felt now. While short-term weather patterns act as immediate triggers for extreme weather – such as the slow-moving high pressure system in the Tasman Sea that drove the warm conditions in May – all of these shorter-term weather patterns are being influenced by the build-up of heat in the climate system from the increasing amount of greenhouse gases in the atmosphere. The warming climate increases the likelihood of unusually warm and hot conditions, regardless of their immediate triggers. This influence of climate change is evident in the long-term increase in the intensity and frequency of many extreme weather events in Australia and around the world, with serious and costly impacts on our communities, infrastructure, economy, and the environment. The frequency of record heat events has doubled from the middle of the 20th century to the present, and over the past decade, record high temperature events are occurring three times more frequently than record cold temperatures. Over the period since the 1970s, high bushfire danger weather has been on the increase in southeast Australia. We are halfway through the critical decade for action on climate change, yet Australian emissions have still to make a decisive turn downwards. It is time to take action on climate change or else the climate system’s mood will only get worse, escalating risks for our health and well-being, for many sectors of the economy and for the natural ecosystems that we depend upon. Notice anything special about the last few months? Extreme Heat Notice anything special about the last few months?